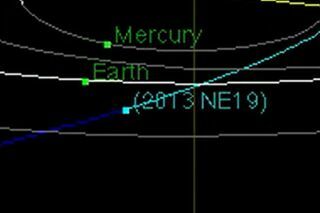 Diagram showing orbit of near-Earth asteroid 2013 NE19, which passes close to Earth on July 22, 2013. A newfound asteroid about the size of a football field will cruise past Earth tonight (July 22), and you can follow all the action live online. The near-Earth asteroid 2013 NE19, estimated to be between 194 feet and 426 feet wide (59 to 130 meters), will pass within 2.6 million miles (4.2 million kilometers) of Earth tonight — about 11 times the distance between our planet and the moon. There is no danger that it will strike Earth on this pass, scientists say. The online Slooh Space Camera will webcast live views of 2013 NE19's close approach as seen from an observatory in the Canary Islands off the west coast of Africa. You can watch the asteroid webcast live here on SPACE.com at 9 p.m. EDT (0100 GMT Tuesday), courtesy of Slooh. Asteroid 2013 NE19, which was discovered just last Monday (July 15), will be quite faint, making it a difficult target for backyard observers. But it should be readily visible in Slooh's remote-controlled telescope, the group said. "Slooh's imaging technology and high-altitude location in the Canary Islands are well suited for a tricky object like this, which may be impossible for garden-variety setups to capture," Slooh CEO Michael Paolucci said in a statement. The Slooh asteroid webcast will feature commentary by host Paul Cox and other experts. Viewers can watch it directly from the Slooh website (www.slooh.com), and via a related iPad app. The discovery of near-Earth asteroids such as 2013 NE19 highlights the fact that scientists have spotted only a tiny fraction of the space rocks that come close to our planet at some point in their orbits. "While we have discovered more than 10,000 near-Earth asteroids and comets since 1898, there are still many more roaming around the solar system undetected," Cox said in a statement. "In fact, by some accounts, there could be more than a million asteroids in the 30-meter (100 feet) range, which alone could cause significant damage to major populated areas." Asteroids have pummeled Earth since its formation, sometimes dramatically shaping the evolution of life on this planet. For example, scientists think the dinosaurs were wiped out by a 6-mile-wide (10 km) object that struck Earth 65 million years ago. Editor's note: If you snap a telescope view of asteroid 2013 NE19 or any other night sky object that you'd like to share for a possible story or image gallery, send photos, comments and your name and location to managing editor Tariq Malik at spacephotos@space.com.